Most role playing games and LARPs are written to be played face-to-face. But every once in a while you'll find one that has been created explicitly to be played online. 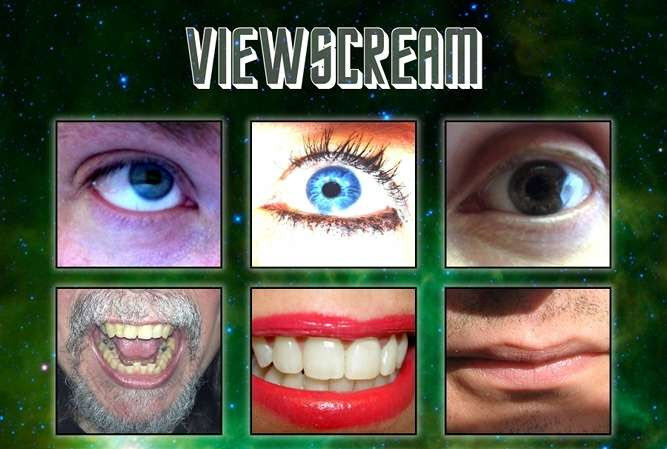 ViewScream is such a game. I backed it when it was a Kickstarter many years ago, but will shamefacedly say I haven't read it or tried to bring it to the "table" (virtual table, in this case). The premise of the game is that you are various crew members. I though that all the included scenarios would be based on being on a space ship, but there are settings where you are cyberpunk crew hacking into a corporation, and other such settings. In all of these, you are physically separated, and communicate through video and audio channels remotely (and hence how it is played explicitly online with video conference tools such as Google Hangouts and Roll20). Hmmm... the cover of the game is mildly disturbing. Recently, Daniel threw it up on the Gauntlet online play calendar, and I signed up, along with fellow players David and Keith. We chose the scenario "Black Widow, Brown Recluse". Our situation involves being on a space ship with a rogue AI that was killing the crew. Everyone gets a different character sheet which has some secrets that belong to them, as well as various "fixes" they have problems, and some secret background they get to establish. This is one of the things I think the game does exceptionally well, is allow you to customize the character towards some fiction you generate or want to explore, so even if you played the same scenario, there would be varying storylines and motivations. The facilitator (in this case Daniel) still plays a character, and in our scenario that character is the Bridge. They're responsible more for establishing communication between the players and keeping the narrative rolling, but once the other players get going, that load might be alleviated. They also have win conditions, but ones that are different from the other player characters. The rest of us (Sensors, Engineering, Helm) had various problems we were facing, and various fixes we could try to perform to help others, but the mechanics here are very light. Basically the game is giving you some story prompt type fiction to help you role play out various scenes. The roles also have some personality guidelines and other secrets which flavor all the interactions. Also worth mentioning, if you don't fix all your issues within a time constraint, your character will die, so there is some motivation to get things moving. I thought this might come across as a little stale or mechanical, but that wasn't the case at all, especially if you have folks interested in exploring the role playing aspects. I was additionally surprised at some of the fun interpersonal conflicts, touches of hilarity, and a touching moment or two that passed between some of the characters.